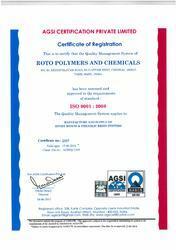 Established in the year 1998, Roto Polymers And Chemicals is a Chennai based manufacturer, exporter and supplier of basic & formulated epoxy floor coatings, industrial floor coatings, epoxy resins, curing agents and high performance phenolic resins. Our range includes Industrial bonding compounds, epoxy floor coatings, industrial floor coatings, loop sealants, potting and encapsulation, epoxy coating, epoxy floor coatings, floor paint and others. We are supported by a team of dedicated professionals experienced in this field and have well designed machinery and well-equipped laboratory. One of our main fortes is in offering customized solutions for challenging applications based on our customers’ requirement. If your material performance requirements should extend beyond the properties of Roto Polymers and Chemicals standard products, our technical team will work closely with your manufacturing specialists to determine your specific product needs from start to finish, ensuring consistent contact and ideal results. Under the able and deft guidance of our director, we, “Mr. Brijesh”, we are able to lead among the counterparts in this stiff market competition. Owing to his experience and knowledge coupled with innovative business ideas, we have been able to attain a remarkable and praiseworthy position in this domain. Manufacturing and Trading of Epoxy Resins and Epoxy Coatings. Electronic Components such as Deflection Coils, Capacitors, Resistors, etc. Masking of Electronic Circuits on PCBs. Lining of tanks for chemical storage, neutralization pits, pickling tanks etc. Miscellaneous bonding in speakers, energy meters, bangles, lamps, pens etc. We offer consistent quality products to various companies by maintaining internal quality control on three aspect of production process, while procuring raw material, in process specifications and pre-dispatch of our final products. We also have excellent in-house testing facilities to check various test parameters related to the manufacturer of epoxy & hardeners that includes chemical bonding compounds, epoxy floor coatings, industrial floor coatings, potting and encapsulation, epoxy primers, epoxy floorings, epoxy paints and others. We have implemented elaborate test procedures related to producing & maintaining quality products in view of our desire to firmly establish ourselves in the market as a reliable manufacturer of epoxy resins & hardeners. The epoxy systems are ideal for filling cracks and veins in natural stones in marble, granite, limestone etc., either used clear or with coloring agents as per color of marble. epoxy system reduces breakage of marble and granite during handling and polishing operations by sealing small vein cracks and flaws in cut slabs. This should be applied to the cut stone surface before calibration and grinding/polishing stage in marble production. Ensure the stone surface is dry. The resin and hardener are taken in the proportional weights and mixed thoroughly. Apply the mixed material by pouring onto the stone slab. Spread uniformly over the area to be treated. Allow curing for approximately 24 hours. Solvent free "Rotex" epoxy systems for coating of RCC structures in aqua units.